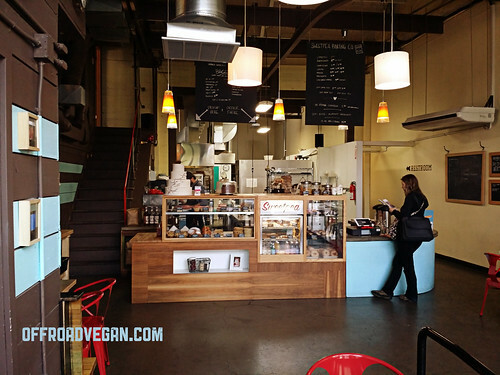 Believe it or not, we have so many vegan establishments in Portland that it is still a possibility to explore new ones. And this is exactly what happened to me recently when visiting Sweetpea Baking Company in SE Portland. I had been there before, but usually only to pick up a special order cake, or for a coffee emergency. 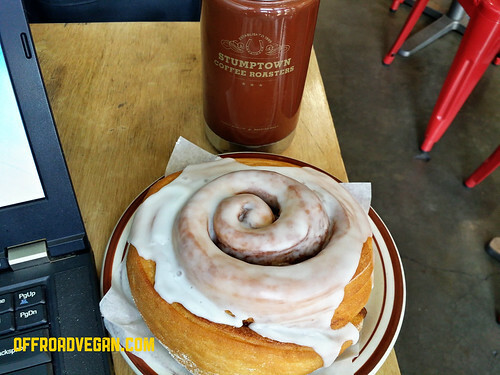 But today I visited with the intention of actually exploring the place – starting with one of their ginormous cinnamon buns. And what a place to start! The cinnamon monstrosity was absolutely amazing, with just enough cinnamon-frosting ratio and a caramelized, crunchy bottom. Sorry to say, a large portion of it was donated to compost lest I suffer from early onset diabetes or something. And I would have eaten the WHOLE thing. Laptop added for scale. This puppy is huge. Bring a friend. 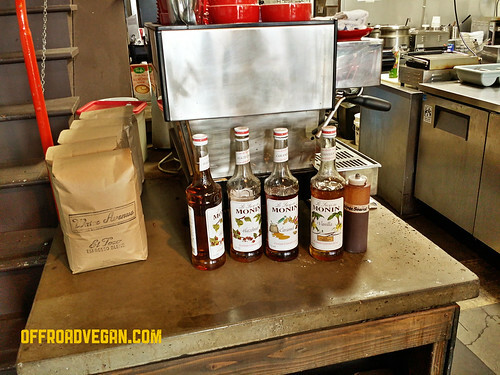 I also mated a soy latte to the order and the Water Avenue coffee was perfect and prepared well. The bakery is spacious, well-lit and clean. There are plenty of power outlets for the laptop jockeys and the classic bakery smell and commotion was a warm and cozy benefit to my temporary office space. The staff is also warm and helpful. 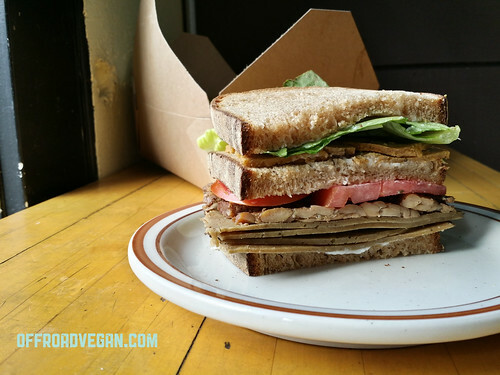 For lunch, I opted for the “The Zurek” which is a vegan club sandwich stuffed with house-made seitan, pastrami seitan, tempeh bacon, lettuce, toms, and the usual mayo. This sandwich is NOT messing around. It’s imposing bulk acts as a forewarning of the deliciousness you are about to enjoy. I found the flavors in this sammy to be surprising – probably from the pastrami. The bread was perfect and accompanying salad was a nice touch (but I have no idea when I will be able to finish this). Have extra napkins handy. Sweetpea’s menu continues to really impress me. With breakfast staples like Biscuits & Gravy (A Portland law, I think), openfaced sandwiches and tons of delish baked goods, I will be back again. Lunch is equally impressive with three huge salads and over ten sandwiches to pick (and even a build-your-own option). 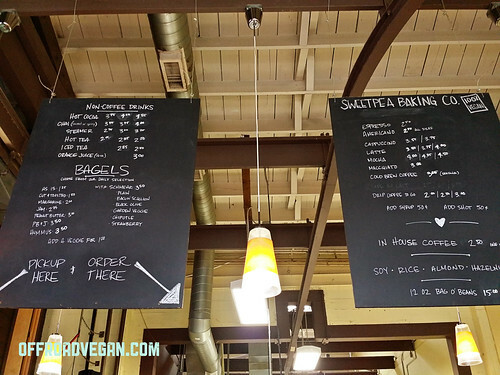 Prices are reasonable, nothing really seems out of place as a vegan bakery is concerned. Traffic control and reasonable prices. 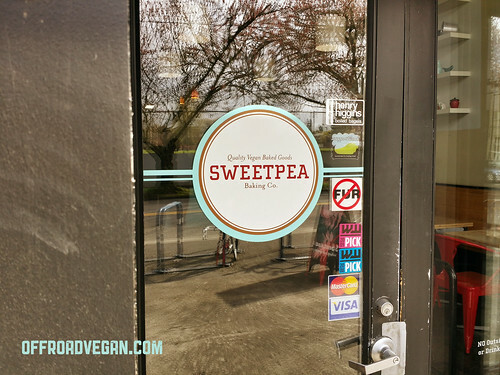 Business must be good at Sweetpea – the door was hardly closed for a minute while I was there…and that is a REALLY good thing for these core vegan establishments in Portland. 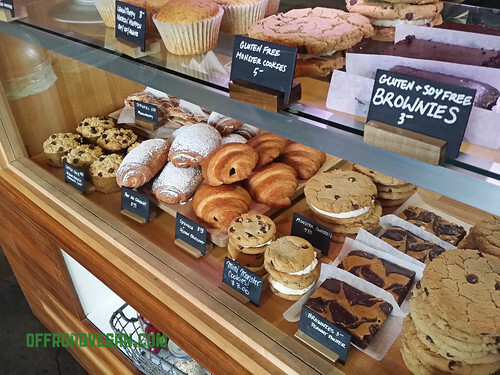 Stop by Sweetpea – but be sure to bring your appetite.